Most speakers make speaking to a group more stressful than it needs to be because they prepare incorrectly. In preparing a speech, most people take the same approach — creating, writing and practising the speech in the same order they will deliver it — and it is wrong. • Write: They write their speech like a letter or e-mail — from start through to the end. • Practise: They rehearse by starting at the beginning and working their way through until they lose their way, go back to the start and make their way a little further into the speech before they lose their way, go back to the start… and so on. Eventually, they make it through to the end and they think, “I’m ready”. It has been proven that the most memorable part of your presentation is the conclusion. So, the focus should not be “What will I start with?” but “What will I finish with?” If the last words your audience hears have the chance of the most impact, they should be carefully chosen and powerfully delivered. The message you want to leave your audience with is the most important — so start your writing with that. If you have a clear picture in your mind of where you want to finish, and you know what your audience’s attitude is to the subject at the start, then your speech-writing task is nothing more than joining those two points. See your speech not as one entity, but as a series of “chunks” —and if you start your writing with the concluding “chunk”, then this will be the part you are most familiar with. The concept of “chunking” is important in practising effectively. Spend the most time practising the conclusion so it is the part of your presentation you know best. This way, you are working towards the part of the presentation you are most familiar with, so your confidence builds as you progress. This is the opposite of most speakers who work away from the part they know best — the opening. The opening is actually the part you need to worry about least. You always have the luxury of checking your opening words just before you stand up to speak. Most of us go into a presentation hoping we won’t lose our way or have our mind go blank. And it’s a forlorn hope. They say the human memory starts from the second you are born — and only stops whenever you stand in front of a group to say anything. Accept that your mind will go blank or you will lose your way. That is not the problem. The problem is getting back on track. And if you know your conclusion clearly, this becomes much easier. If you know the opening best, you are stuck with thinking back and trying to retrace your steps to find your way. If you know the conclusion best, it is like having the destination keyed into your GPS. If you take a wrong turn, it just says “recalculating route” and gets you back on track to your destination. If you have confidence in your conclusion, you are more likely to deliver it strongly. 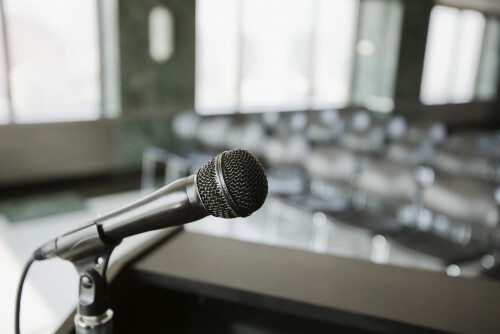 Most presentations are let down by their vocal delivery — particularly the conclusion where it just seems to fade away. The sign of this is when the speaker has to say “thank you” for the audience to realise he has finished. I hope they will applaud. You can feel sure that his conclusion — and probably the entire speech — has failed. The vocal delivery of a speech should replicate the delivery of the caller in a horse race. There needs to be excitement and energy as the horses jump from the gate, but the excitement and energy must be at a higher level when they pass the finishing post. If you know your conclusion best, you are most likely to give it the powerful delivery it needs.